2015 Halloween Project, "Addam's Family"
I could use help with those experienced in recording electric violin with an amplifier. For over a year I've wanted to be part of a virtual orchestra.. plus, it is great motivation for me, thank you for doing this! My violin is a Yamaha silent electric which I play only using my headphones, I have no amplifier to hook up to. Is there a way to record by using just my Mac (latest OS) and/or iPhone6? Good question Karen. I ended up getting a little amp for mine. I didn't know how to amplify through mini ipad or phone... .or computer. I hope someone has some info here for Ya! Thank you Coolpinkone, what kind of amp did you get? I no nothing about amps. LOL.. sheesh, its tougher to figure out the hookups than playing. And I'm pretty geeky! 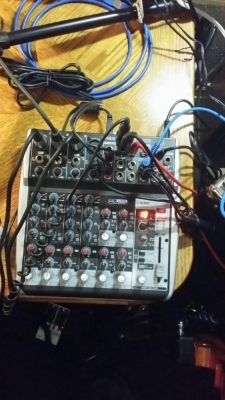 Thanks to the Yamaha's built in preamp, you can probably hook an output cable directly to your computers mic input and use any Mac video recording software to record the video. I believe you need a 1/4 to 1/8" cable. QuickTime Player works fine and is built into the OS. Open the app and choose, "New Movie Recording" under the File menu. My guess is that you would have an easier time with an amplifier though. Wow, thank you.. so very much, I'll try this, if all works out you have enhanced delight in my life, much sincere gratitude here. This works so far: From the violin's "phones" input, I plugged into my Mac's "line in", started a new video recording from Quicktime Player. Although I can plug my headphones into the Mac's microphone to hear as I play, it has a slight delay.. lol.. so instead I'll listen to the "silent" .. less quality sound as I play. At least the recording sounds okay so far. If you have computer speakers, you can plug headphones into one of the speakers and listen in real time without a delay, or at least so small of a delay you won't even notice. That's what I do, you can also play back-tracks on your computer and you will hear them in your headphones as well as the violin. If you get hooked up on streetjelly you'll be broadcasting exactly what you hear in the headphones... of course you'll need to add a mic so we can hear you talk. Next you'll be getting a mixer, which makes it all really easy to add on to. Mic inputs, instrument inputs, even feed the speaker output into it and you can hook up your headphones to it and do all of the above too. Then it'll look like this mess of wires really soon. Ha. Hey there. I record my electric guitar into rockband on my mac book, using a cable with a patch chord on one end and USB on the other. I works great. I had to buy the playstation 3 game "Rock Smith" just for the cord tho... Cool game if you play guitar. Another thing you can use on an I phone or I pad is called "I Rig" i have that too but would rather use the mac. I also have Yamaha SV-130, and PC and Olympus Pen. Is there software (free or inexpensive) for PC/Win10 that could capture both at the same time; sound directly from the violin and the video from the camera?